The grey-headed flying fox (Pteropus poliocephalus) is a megabat native to Australia. It is endemic to the south-eastern forested areas of Australia, principally east of the Great Dividing Range. Flying foxes are the natural host for the Hendra virus, an illness responsible for the deaths of nearly 90 horses and four humans since it was identified in Australia in 1994. It is stated that local councils have put up signs about 50 metres apart along the river banks at St Andrews Reserve warning of the presence of bats and asking people not to let horses graze over there. Flying foxes are protected in NSW under the National Parks and Wildlife Act and, in the case of the grey-headed flying fox, under the Threatened Species Conservation Act (NSW) and the Environment Protection and Biodiversity Conservation Act (Cth). There are penalties, which can be financial, for harming any listed threatened species, including the flying fox. In Nov 2014, thousands of them died in Casino.... temperatures hit record highs at Casino hitting 44.1°C which caused the deaths. Residents were urged not to try and personally help any distressed flying foxes apprehending the risk of lyssavirus infection from bites or scratches. 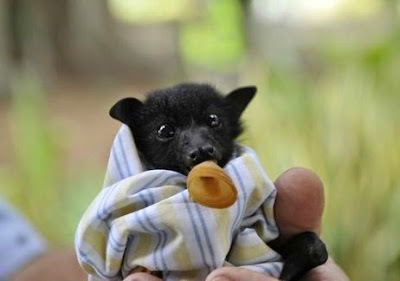 The high temperatures proved to be deadly for flying foxes in the colony, coming just weeks after the birthing season. It was stated that the baby bats or "pups", between two and four weeks old, were still suckling their mothers. It was a sad sight of bats dropping dead from the trees due to heat stress. The WIRES ground crew of volunteers gave the babies a hydrating injection and transported them to makeshift hospitals in homes in Casino, managing to save about 450 baby flying foxes or "pups". 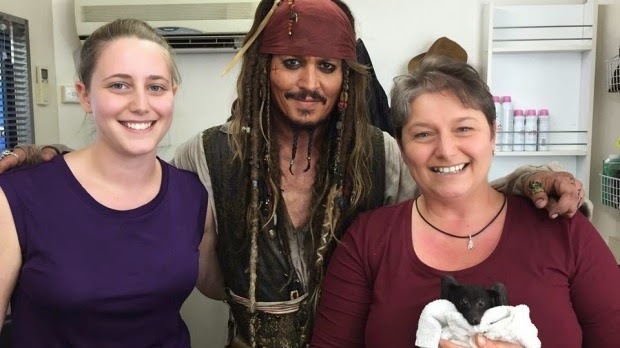 Now the reports suggest that Superstar Johnny Depp has gone batty while filming Pirates of the Caribbean 5 on the Gold Coast – sponsoring one baby flying fox and getting up close with another. www.brisbanetimes.com.au – reports that the actor and passionate wildlife advocate heard about the story of a 30-gram flying fox found orphaned after a recent thunderstorm near where the crew was shooting. The Australian Bat Clinic has now christened the tiny creature "Jackie Sparrow" after Depp agreed to become its sponsor while it's in care. Depp plays Captain Jack Sparrow in the popular adventure franchise. Carers Ashley and Paula Fraser of the volunteer rescue group Bats Qld visited at lunchtime while Depp was still in costume, introducing the star to Fifi, a flying fox rescued from northern New South Wales at the end of 2014. "It was an amazing opportunity; he was so kind and thoughtful. It was an absolute pleasure and honour to have met him," Ashley Fraser said. "He loves bats certainly - he absolutely loved Fifi and thought she was so beautiful." Ms Fraser said Fifi was one of 30 baby bats they rescued from Casino during a heat wave, where temperatures soared to 42 degrees. "Unfortunately it was during baby season, so the mothers gave their last bit of life to the babies," she said. "Fifi was so premature that her umbilical cord was still attached, she became really sick and almost died, but the Australian Bat Clinic managed to save her life and pull her through." Ms Fraser said the creatures often didn't get the respect they deserved. "Unfortunately fear and misinformation has caused some people to not understand their worth and value within our environment," she said. "People have nothing to fear from bats and flying foxes." Depp is on the Gold Coast filming Pirates of the Caribbean: Dead Men Tell No Tales – and created furore with his bringing two Yorkshire terriers in his private jet without proper documents and certification.